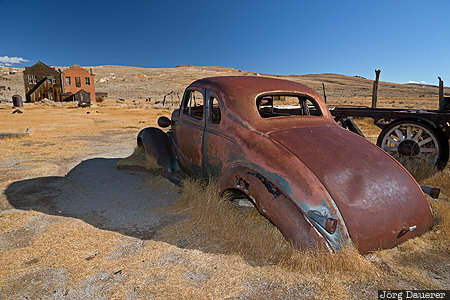 A rusting car wreck in Bodie State Historic Park in front of the ruins of Bodie. A fill flash had been used to illuminate the shadows of the car. Bodie is in the east of California, United States. This photo was taken the afternoon of a sunny day in October of 2016. This photo is part of the exhibition Car Wrecks (October 2017). This photo was taken with a digital camera.